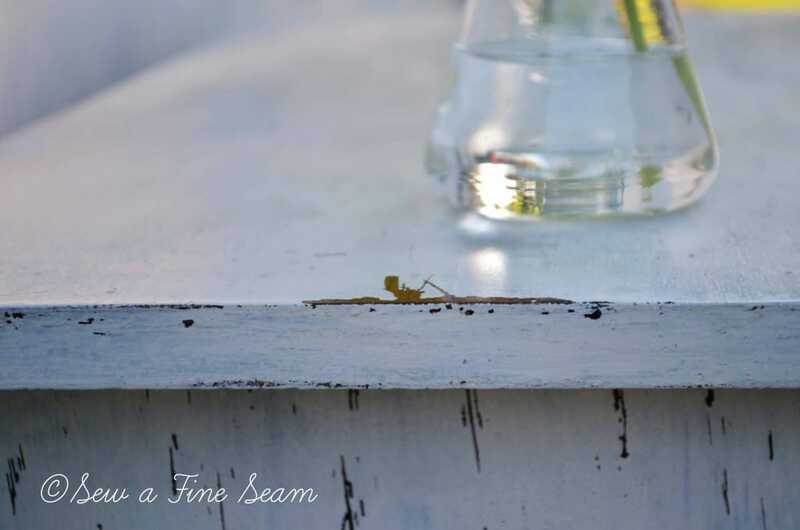 Miss Mustard Seed Milk Paint – Grain Sack on a Dresser! I am feverishly preparing for an event on Saturday. It’s in a small town close to me and I think it’s going to be fun. I’m not taking a huge set-up, just a few small pieces of furniture and some handmade things. I do have a couple new things I just created, and the furniture is freshly made over! Today I painted this dresser. 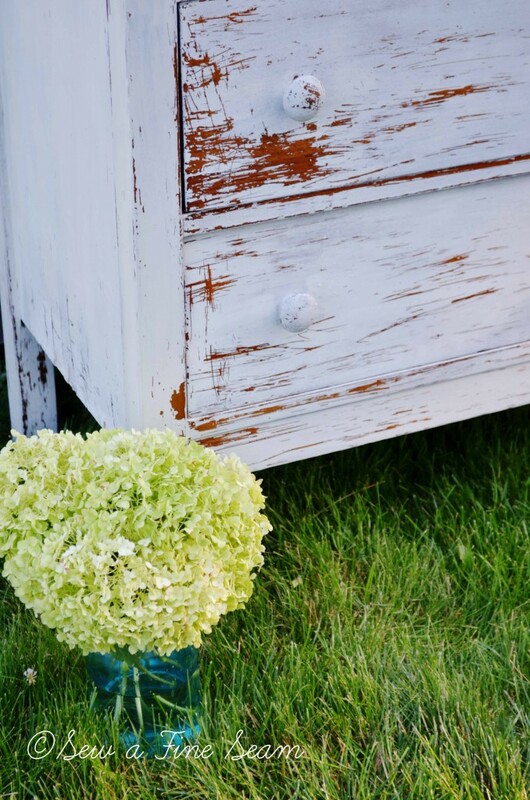 I used Miss Mustard Seed Milk Paint in the color ‘Grain Sack’. I’ve used MMSMP before – here and here. I loved the stuff then and wanted to use it on something bigger. Finally today I did just that. 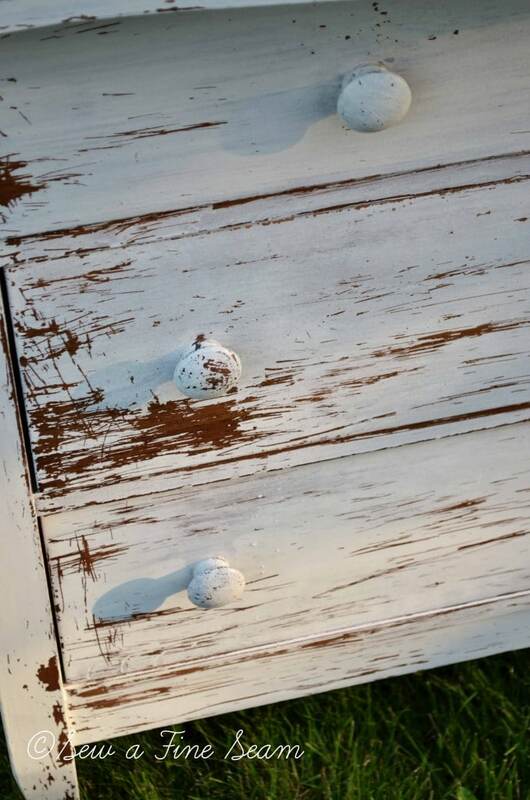 I decided this dresser would be a great piece to use MMSMP on because the finish was rather shiny and I really wanted to see some chipping going on. 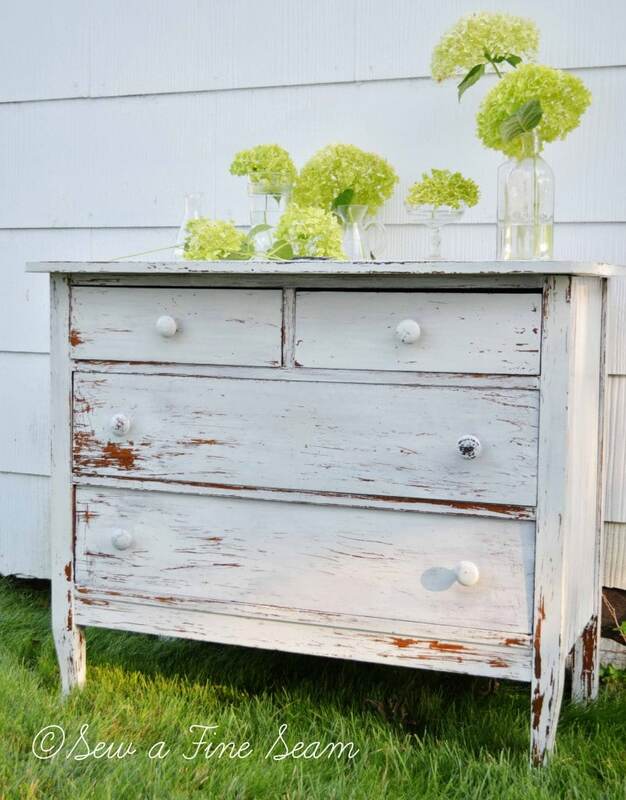 I love this about milk paint. 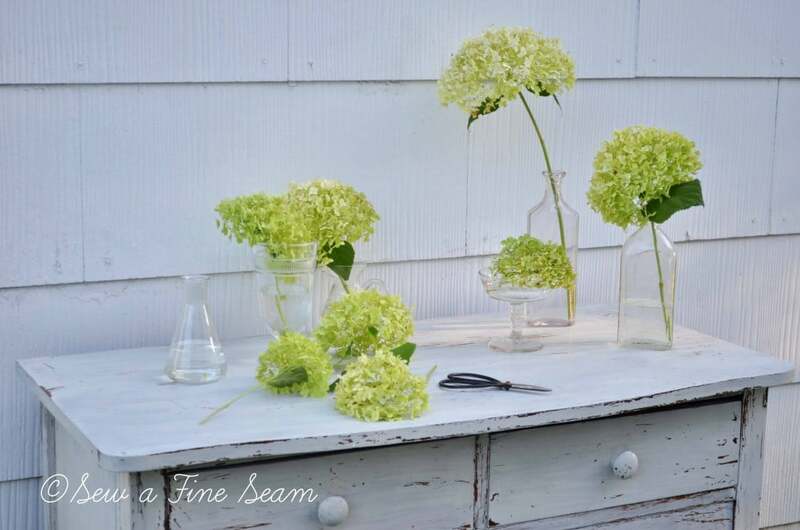 I’ve been a fan of milk paint since before milk paint was the next great thing in the DIY world! I researched it years ago and was going to order some and do a project but I ended up having a friend do the project while I sewed for her. 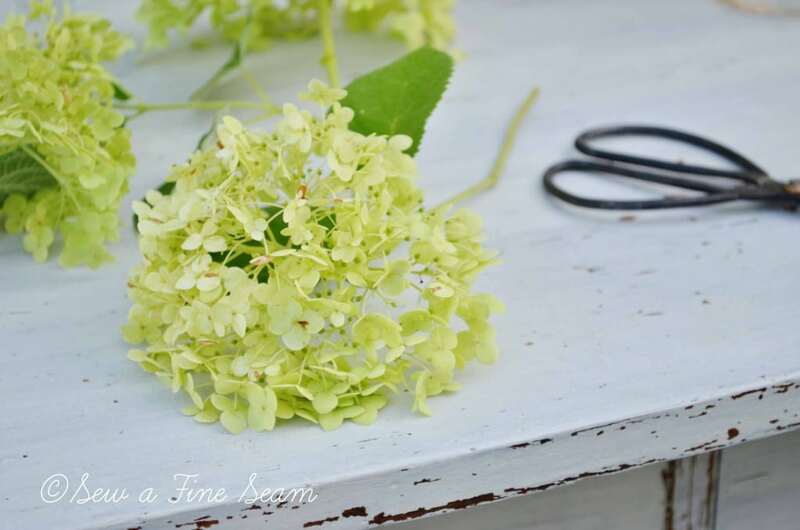 I’m so happy that Milk Paint is now easy to get and that Miss Mustard Seed has such great tutorials on how to use it. I am planning to use this dresser this weekend in my set-up. I’m so happy with the way it turned out. It didn’t chip as much as I thought it might. When I first got it painted I was afraid it wasn’t going to chip at all but once I let it dry and took my putty knife to it, there was plenty of places that were ready to flake off. 2 coats of Annie Sloan clear wax sealed it up and finished it off beautifully. Any water drops that hit it during the staging and photographing beaded up and brushed right off. I didn’t take the time to take the drawer pulls off – they were wood just like the dresser so I just painted them. I think it would be fun to change them out for something bling-y or sparkly but I don’t have time now. If this dresser hangs around for long I might change it up. There is a mirror frame for this dresser that needs put back together. Not sure that is going to happen this week either. The dresser also had side and back boards added around the top making it a dressing table for a baby. I didn’t think to get a pic of it before my hubby yanked them off. Here is a before shot I took right before I started painting. Why is it so easy to forget the ‘before’? I almost didn’t get anything of this before! 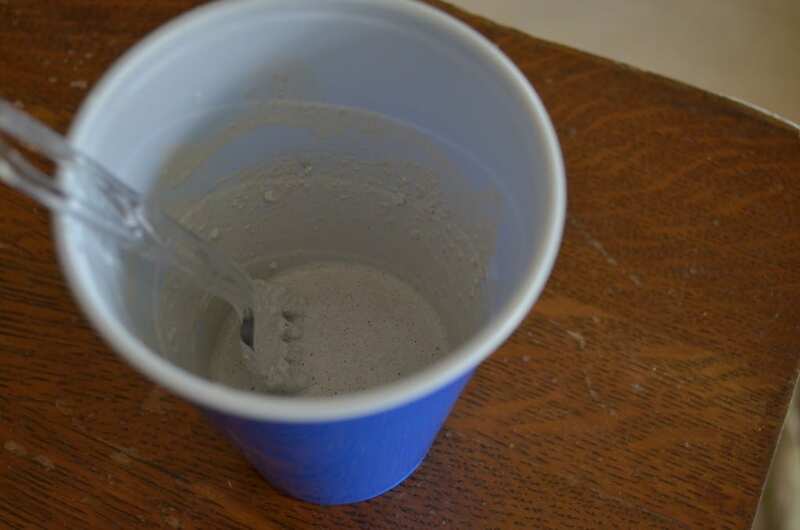 And for those interested here is what my paint looked like after stirring it up and right before I began painting. Chippy goodness! I love how random it is, flaking away in some places, a little here, a lot there. 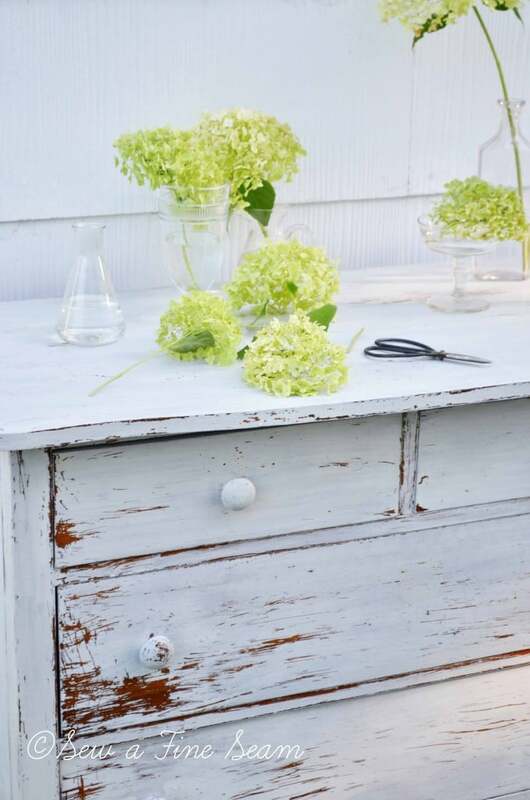 Have you used Milk Paint? « Do it ALL. Or NOT. Looks great. I just did an end table in Grain Sack. Thanks Kim! 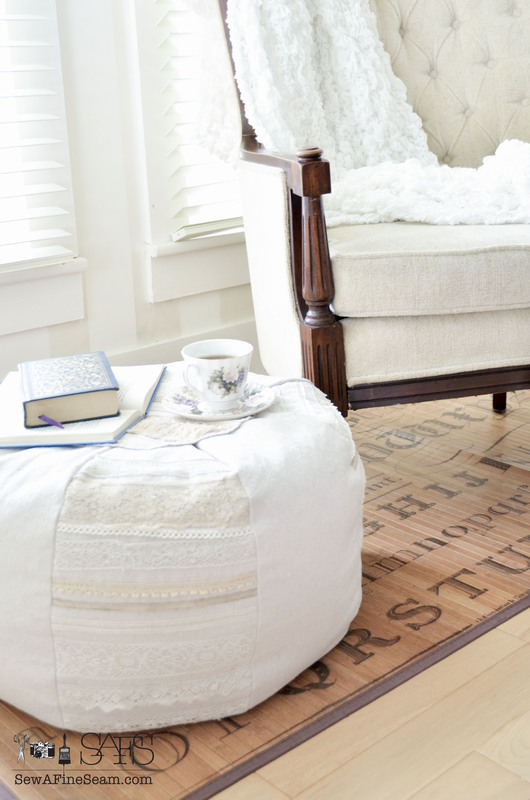 Was your end table the one you did the red grain sack look stripe on? I loved that one! 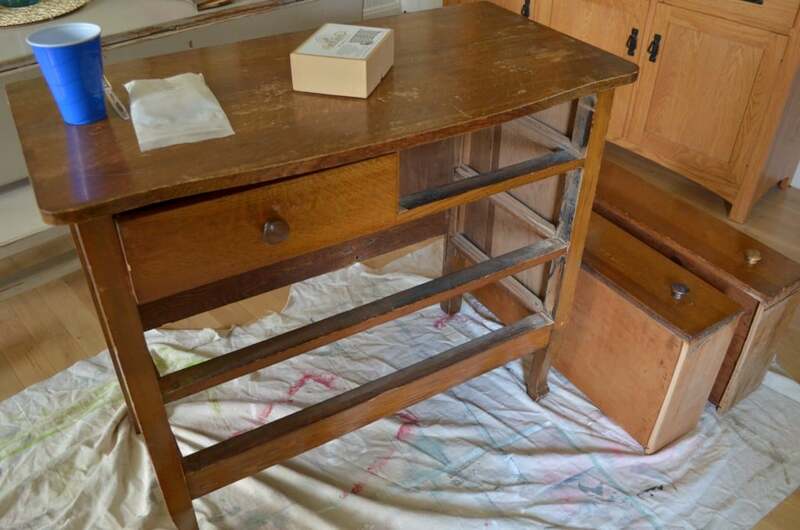 Your dresser is very pretty. I too love miss mustard seed’s milk paint. 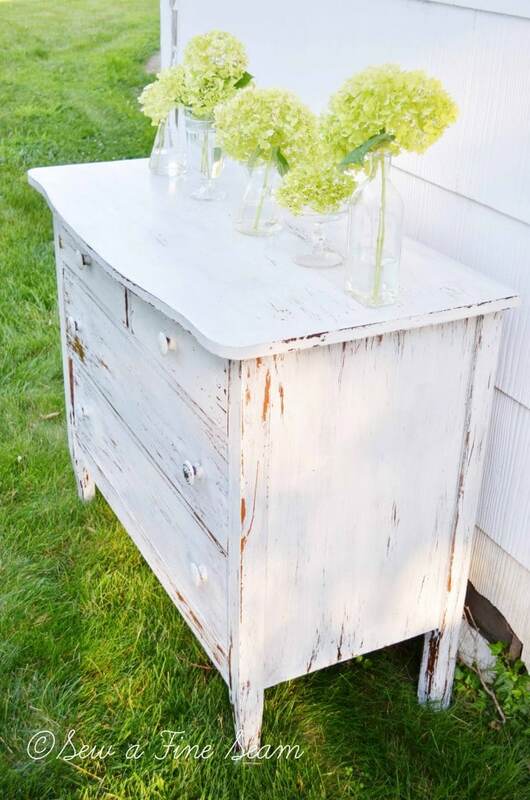 It is fun painting thrifted finds with her milk paint. I am your newest follower. Will you follow me back? Thank you so much! Hi Ellya, thanks so much for coming by and following! I’ll be by to visit soon! Oh my goodness, I love your dresser! 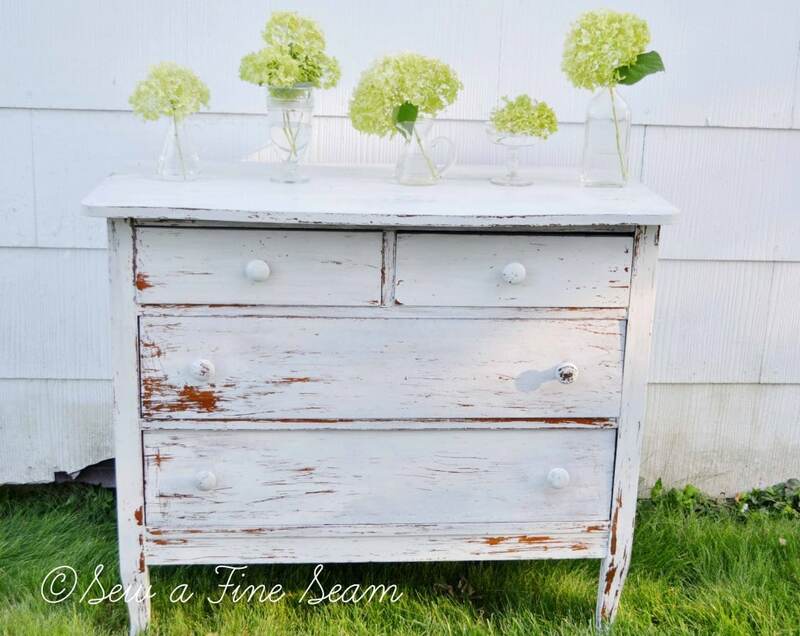 I have not tried milk paint yet… but I want to do exactly this on a dresser for my daughter’s room. Thank you for the inspiration! It is beautiful! I hope you use MMSMP! It is so much fun to use! Takes a bit to get used to the consistency but if you love to paint you will love the challenge of something new and different. I can’t wait to do more! i LOVE how it came out! i have a piece – with a very similar finish – that bird’s eye maple veneer kind of thing – from your close up of the top it looks identical. I think mine is quite a bit bigger though. . . I actually have several “wood colored” pieces – and if left to my own devices – i’d paint out every single one of them. . . but i think there might be a good deal of resistance from Mr. Social Media . . . 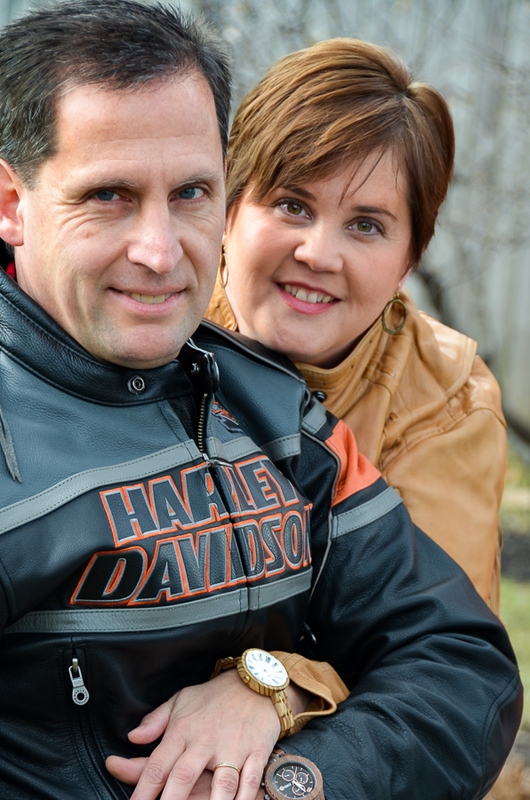 I used to get more resistance from my hubby. 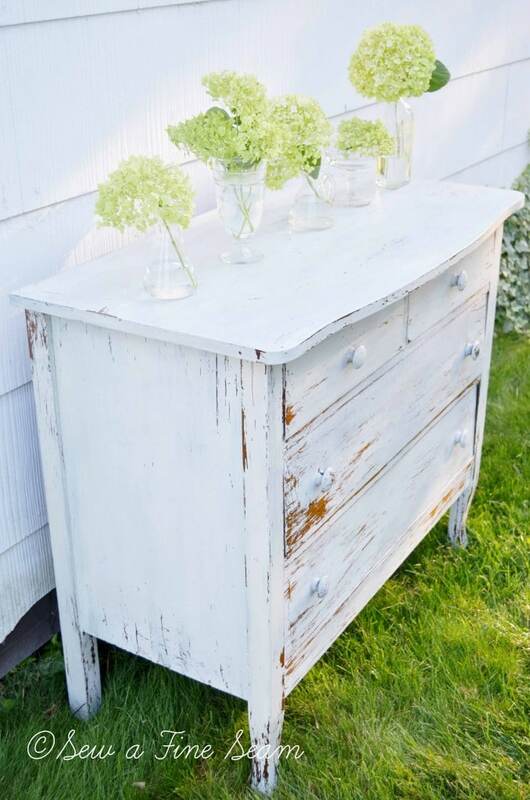 he doesn’t love the chippy look of the milk paint like I do – he likes the pottery barn look of the edges distressed lightly but not the chipping. Too bad – I love it so he will have to get used to a bit of it! He still says I’m not supposed to paint my china cupboard but I can tell it’s more of a show thing than a real conviction! I bought the paint and I keep saying I am painting it as soon as I have time! Thanks Kathy! So glad you came by and took the time to comment! haven’t used it in years! this looks fabulous–you go! Thanks Michelle – I can’t wait to use this paint again. I love the finish on this! Great job! 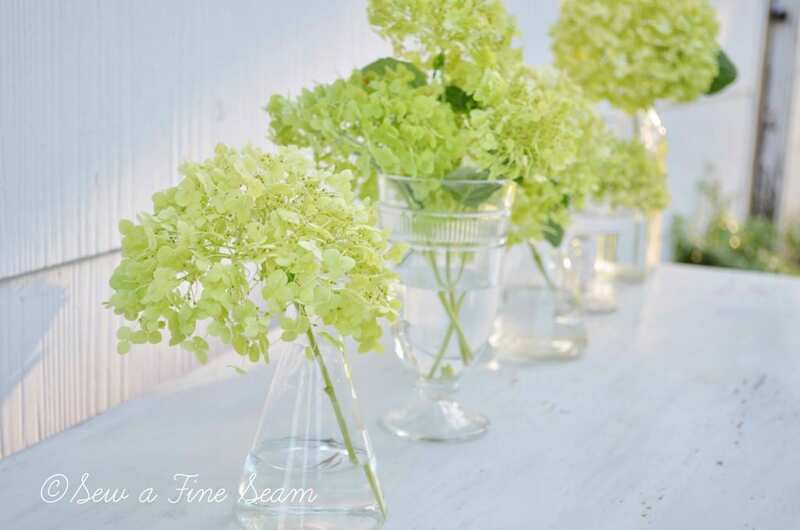 I am featuring this today at Home Sweet Home Jill! Thanks Sherry! It’s always such a thrill to be featured! 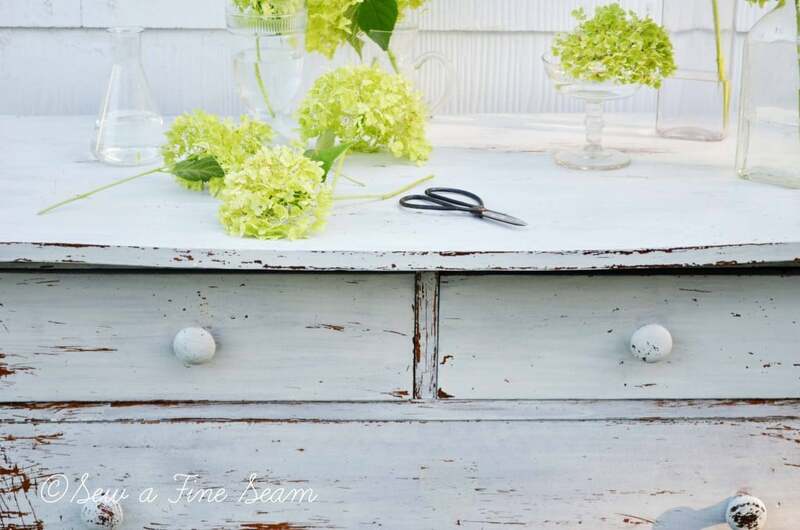 Where do you get your milk paint from? Do you have to order it online?